Washington, D.C., United States, 2013-12-02 — /travelprnews.com/ — After 100 days and 123,039 votes the giant panda cub at the Smithsonian’s National Zoo received her name—Bao Bao—today, Sunday, Dec. 1. Smithsonian Secretary Wayne Clough, Ambassador Cui Tiankai from the People’s Republic of China and Assistant Secretary Kerri-Ann Jones from the U.S. Department of State’s Bureau of Oceans and International Environmental and Scientific Affairs revealed her name at a ceremony celebrating the cub’s first 100 days of life. Bao Bao translates as precious or treasure in English. It was one of five Mandarin Chinese names that were offered for a public online vote from Nov. 5 to Nov. 22. The names were contributed by People’s Republic of China ambassador to the U.S., Cui Tiankai, U.S. ambassador to the People’s Republic of China, Gary Locke and his family, giant panda keepers at the China Conservation and Research Center in Wolong, Sichuan, China, where the cub will live after she turns 4 years old, giant panda keepers at the National Zoo, and Friends of the National Zoo. The ceremony also included special video messages from First Lady of the United States, Michelle Obama, and First Lady of the People’s Republic of China, Peng Liyuan. Both congratulated the National Zoo on the successful birth of the cub and reflected on 41 years of giant panda conservation success as a result of excellent collaboration between the United States and China. The National Zoo received a state gift of two pandas in 1972 following the seminal state visit by President Richard M. Nixon and Mrs. Nixon. The day’s festivities concluded at the David M. Rubenstein Family Giant Panda Habitat. Chinese lion dancers led guests to the giant panda yards where Tian Tian (t-YEN t-YEN), the cub’s father, received a frozen treat. Mei Xiang (may-SHONG) gave birth to Bao Bao Aug. 23, 2013. Her birth was broadcast live on the panda cams, sponsored by the Ford Motor Company Fund. She will make her public debut in early 2014. 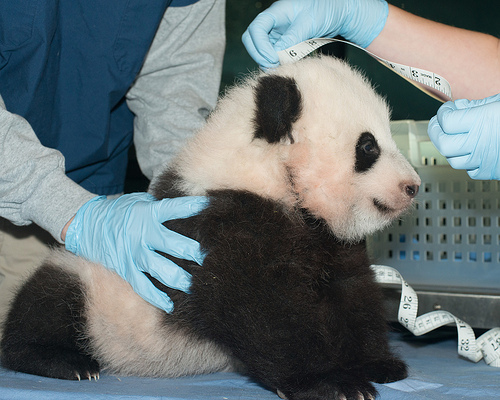 Caption: Giant panda cub, Bao Bao. Photo: Connor Mallon, Smithsonian’s National Zoo. This entry was posted in Attractions, Entertainment, Travel & Kids, Zoo and tagged Bao Bao, Cui Tiankai, Dennis Kelly, giant panda cub, Kerri-Ann Jones, Smithsonian National Zoo, Wayne Clough. Bookmark the permalink.